While more and more people are becoming aware of the benefits of supportive footwear, many people do not consider the insole inside their shoes. The standard insole that comes in a running shoe is a piece of EVA foam; it will provide a feel of softness underneath the feet and protect the stitching within the shoe. A supportive insole, on the other hand, can work alongside supportive footwear to provide more comfort, support and stability within the shoe. We offer a wide range of insoles available in store to cater for different biomechanical needs, and we also have excellent links with local podiatrists who can provide you with orthotics that are completely custom made to each individual. to absorb the force before dispersing the shock waves laterally and retaking its initial form immediately. This means that with the next impact and all those thereafter it is still 100% efficient. Utilising Sorbothane’s solid properties, the material deforms proportionally against the impacting party which reduces the speed of impact and thus the weight/pressure available to cause damage; these 2 approaches combined, result in incredible shock absorption. The Sorbothane full strike insoles are designed for activities where the whole foot is subject to impact, which is applicable to the majority of runners. Due to their slim, flat shape, they fit easily into low volume shoes such as running spikes and racing flats. The Sorbothane double strike insoles, on the other hand, contain Sorbothane material targeted in the heel and forefoot areas for sports where these 2 parts of the foot are subject to impact, again suitable for the majority of runners. Combined with a moulded heel cup and integral contoured arch, these fit well into walking shoes and training shoes. For a more mechanically structured insole, Superfeet offers a diverse range for different sports and activities. Based on podiatric medicine, they help adapt the 2-dimensional midsole of footwear to your 3-dimensional foot. 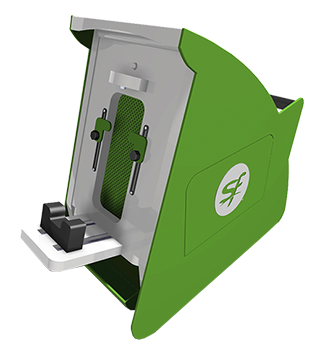 Superfeet uses a fit profile related to the feel of the insole’s shape under the foot and heel to determine which of their insoles are the most suitable for an individual’s foot shape. The volume of an insole then suggests what footwear each insole is suitable for. All Superfeet products contain 3 key elements: a structured heel cup to encapsulate the soft tissue in the heel for maximal natural shock absorption, rearfoot support to stabilise the rearfoot and arches, and a stabiliser cap to create a supportive shape. The overall insole aligns the foot into a more neutral position resulting in better alignment for the knees, hips and back. During exercise, 3-5 times our bodyweight in force goes through the feet; Superfeet help regulate the necessary motions of pronation and supination within the feet, working alongside supportive footwear to help prevent an excessive strain of the muscles, tendons and joints within the body. This minimises the risk of many common injuries such as ITBS and shin splints. As previously mentioned, Superfeet has a wide range of insoles across the spectrum for different biomechanical and shoe requirements. The Deluxe ¾ fit Superfeet are designed for tighter fitting, business, dress and casual shoes, making them ideal for those wearing smart shoes for work and spending a lot of time on their feet. There are a few full length insole options that cover a variety of physical activities; blue, green, yellow, black, orange and berry. For a plusher feel, the Copper DMP Superfeet use a memory foam top sheet to improve comfort and provide a more personalised feel whilst still being biomechanically efficient. These are all trim to fit so can be adjusted in size to allow optimal function within the foot and optimal fit within the shoe. Our technical consultants in store are all fully trained in the fitting process and will be able to advise you as to which insole will be best suited to your individual requirements. If you are searching for pain relief or a bit of extra comfort, you could also try the MAX Pain Relief or the MAX Comfort insoles. Superfeet also offers customised products. Alexandra Sports is privileged to be the only running shop in the UK with a Superfeet custom-fit pod; allowing us to make these custom products in-store. The custom Superfeet have the same makeup as the trim to fit insoles, but the separate components are heated up and then vacuum moulded against the foot for a personalised fit. These are a good option for people who have a significant difference between their left and right feet as they are moulded to each foot separately. A more premium option is the custom green Superfeet which comprise a cork layer around the heel; this provides extra stability and also gives more cushioning. All of the insoles stocked in store are off the shelf insoles, and while designed to help you exercise more efficiently and reduce injury, they do not offer the same level of personalised support and stability as orthotics. We appreciate that orthotics are a more costly option, and it is not uncommon for people to try off the shelf insoles prior to seeking podiatric advice. However, a podiatrist is more specialised and can provide insoles moulded to your feet only and with the appropriate support for your individual feet and biomechanics. These can then fit into your running shoes, work shoes or any other footwear to provide you with adequate support and stability regardless of the activity. With an in-depth knowledge of biomechanics and regular podiatry training, all of our technical consults can competently assess and recommend which insoles will be the most beneficial for each individual’s performance based on their biomechanics and sporting activities. We will honestly recommend the insoles most suitable for you and if and when appropriate, recommend you to a podiatrist if orthotics are the most appropriate option.